Every summer, it’s the same: forests flare up like kindling, tired emergency crews fall back along the firebreaks, home owners stand guard on their roofs with pitifully thin garden hoses, and the skies are crossed with planes and helicopters cutting through the smoke to drop the equivalent of a teacup of water on the blaze below. Perhaps that’s why I liked this photograph from among the many more dramatic shots taken in the last two weeks. Although cropped to feature the plane in action, the image still suggests that we are looking at a child’s toy, or at least a movie made for the younger set. Although lacking the spectacular power of Air Force flyovers on July 4th, this nondescript supply plane would be thrilling to anyone still capable of being dazzled by simple technological prowess. And the red fire retardant swooshing behind it bundles together work, warfare, firefighting, fire, drama, and good works alike into a visual emblem of adventure. The West still evokes the majestic, thrilling chords of romantic heroism, even as it burns like the gates of Hell. The photo doesn’t just play the old tune, however, for it captures as well the miniaturization of human effort when set against the vast backdrop of nature. Westerners get that, although they also forget it from time to time. How can you blame them, for modern civilization is a story of harnessing nature’s power and of living far beyond what the terrain alone would allow. In the past 100 years, the US has damned the rivers, pulled water, oil, and coal from deep in the earth, provided electrical power for everyone, and made the desert bloom. All it takes is a good fire, however, to remind us that human scale is a small thing. Until, that is, the cool rain finally falls and amnesia returns. I’ve posted on the fires before (here, here, and here), and I suppose I will again. Every summer it’s the same. Except, of course, when it gets worse. As Timothy Egan points out, the combination of global warming and Republican ideology can only lead to disaster. Unrestrained growth while cutting government services (as for fire prevention and fire fighting) gives new meaning to hubris. Need I add that currently these services are underfunded? For example, the small fleet is aging and some planes have had to be grounded, and states and municipalities espousing low taxes once again are turning to the federal government for a bailout rather than burn to the ground. By trying to live well on the cheap, people are playing with fire in more ways than one. And when a political party or a society develops an excessive appreciation of its own powers, nature is sure to provide a harsh lesson in humility. Photograph by Kim Raff/The Salt Lake City Tribune. At least since Nathanael West, artists have turned to California for periodic images of an American apocalypse. This photograph fits nicely into that category. 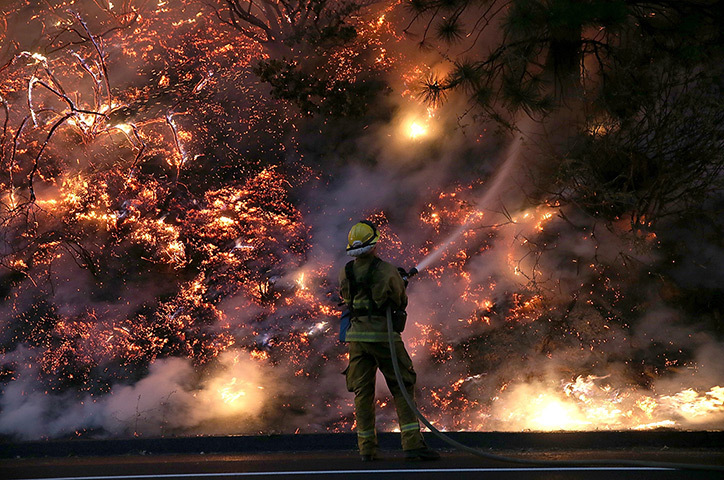 Cars stream along a Southern California highway as wildfires rage across the mountains. The fires seem all-consuming, yet beneath that terrible horizon motorists can still creep along in semi-darkness. Indeed, lights have to be turned on in the valley despite the radiant holocaust above. This fusion of fire and darkness seems a premonition of hell, perhaps the level reserved for those who are complacent amidst pending disaster. 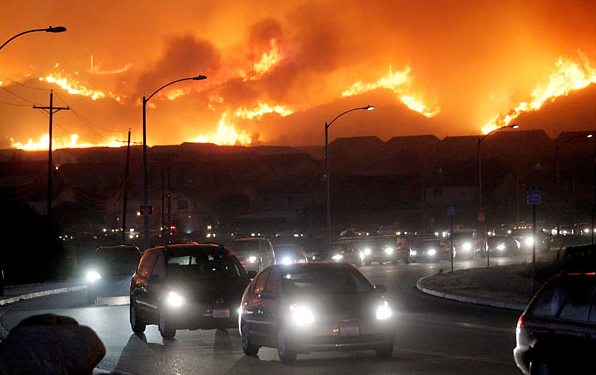 The New York Times caption said that the traffic included residents fleeing their homes in the hills. The photo contains a larger story as well. Intensive automotive use is not the direct cause of the wildfires’ destructiveness, but it is a key part of a larger pattern of land use, resource consumption, and social organization that is the reason the fires burn so extensively and cause so much damage. Likewise, the combination of business-as-usual behavior on the highway (a good thing in itself, of course) and the emotional tone of the twilight exodus captures an attitude of normalcy-by-denial while suggesting its larger cost. That attitude will result in insurance claims being filed, homes rebuilt, and another turn of the wheel. Perhaps one of the symptoms of a catastrophic culture is that people take more pride in surviving disaster than in preventing it. Nothing to brag about, of course, but calm, resolute determination to carry on during the worst of it and then rebuild. If a bridge collapses as happened in Minneapolis, then build a new and bigger bridge rather than reassess the mixture of automotive and light rail transportation. If the levees break as in New Orleans, rebuild the city right where it was rather than move it inland while improving on past inequities. If the financial markets collapse, shore up the banks rather than jettison the ideology that destroys public goods to fuel private greed. Bearing up and rebuilding makes sense during a war, but the major economic and environmental damage of the 21st century has been self-inflicted. Take another look at the photograph. The End Time may not be here, but you may be looking at the last days of twentieth-century America. Photograph by Dan Steinberg/Associated Press. The post today can be somewhat brief, not because there isn’t much to say, but rather because, well, we’ve said it several times already (e.g., here and here), most recently two weeks ago (here). Today’s photograph simply makes the point in dramatic fashion. Wildfires are overrunning different parts of the world and in ways that are completely out of synch with normal weather patterns … and in ways that really ought to be of some serious concern. They are catastrophic in their effects, both economically and environmentally. But the bigger catastrophe—or perhaps the proper term is “tragedy”—is that we seem to have begun to take them wholly for granted, treating them as the new normal. Or, as in the photograph above, treating it as an interesting backdrop to an otherwise romantic scene of personal avowal and commitment. What better way, after all, to secure one’s wedding vows—“for better or for worse, through sickness and in health”—than to locate the beginning of one’s life long future with another person against the conflagration that apparently promises to be there forever and anon. It really is hard to know what to make of this photograph. For one thing it has appeared at a number of different “pictures of the week” slide shows for different national news groups, none of which otherwise pointed to or commented on the wildfires burning in the background. And even if there was something “new” to report on this account, its not like one more photograph of the fire is adding probative evidence to make a claim about basic facticity. I mean, does anyone really question whether these wildfires exist (even as I write that I know that there have to be “fire deniers” somewhere in the world, but for the remaining 99.99% of the population, do we really need one more picture of a wildfire to make the case that such fires are and have been raging out of control?). That said, it should also be noted that the photograph is being taken by a photojournalist, not a wedding photographer, and yet it is also something of a mashup of two photographic genres. So if the photograph is not contributing to the “news” what is it doing? One answer to this question might be that it is offering evidence of a pervasive attitude—and attitudes, of course, are incipient actions.The caption identifies a couple near Bend, Oregon posing for a wedding portrait. It is hard to register the photograph as anything other than a publicity stunt, perhaps an advertisement for the next apocalyptic movie to come down the pike. But, there you have it, its a “real” photograph of a real couple. 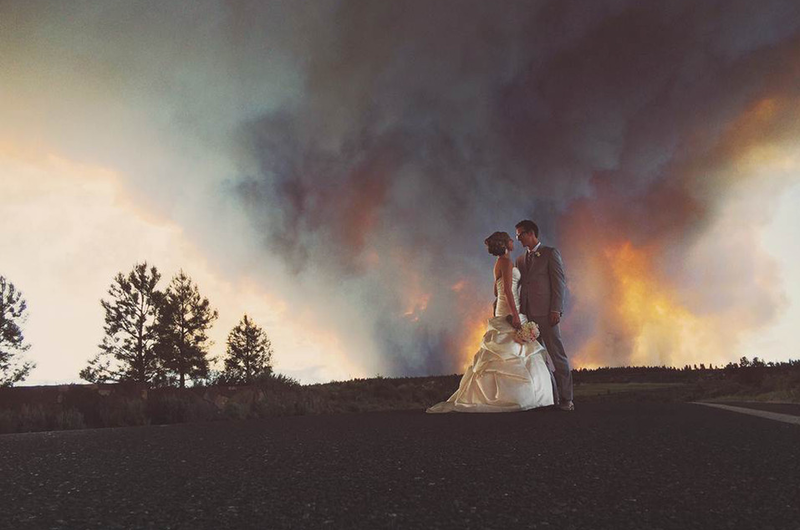 Why settle for a lake or a pond or a nestled grove of trees to mark your nuptials for posterity when you can have a raging wildfire in the background! The fire was apparently close enough that the minister performed a “shortened ceremony” so that the wedding party could be safely transported elsewhere for the reception, but then again it was not so close that the couple seems distracted by it from the passionate fires that burn within their own breasts (or so we might assume). The irony is astonishing. Then again, perhaps the irony here cuts in a different direction if we can assume that this woman and this man are actually dedicated environmentalists and that they are using the occasion of their union to call attention cynically to the inanity of such rituals and ceremonies when in fact the world is ablaze—and the fire is getting ever closer. Perhaps in the next moment (or at least after their reception) they peel off their wedding vestments and don the attire of activists concerned to alert the world to the need to address the problem. Maybe. It’s hard to know. It would certainly make for an interesting movie. However you read the photograph—whatever attitude you note or potential action you see— there can be little doubt that it pictures a profound problem that surely predicts a troubling future. Right now it seems to point to a tragic outcome, particularly if we persist in accepting the background in the photograph as just another backdrop for a dramatic wedding portrait. The fire, after all, will only continue to burn brighter and to get closer. If we continue to ignore that problem, however, or worse, if recast it as something which is altogether normal, it is possible that the story which points to a tragedy will end as a farce. For better or for worse … indeed. One of the difficulties with global warming is that it is kind of hard to see. We can see the effects of a tornado or a hurricane or a wildfire, but “global warming” seems to be a somewhat abstract concept. Yes, winters have gotten colder and summers hotter; sure tornadoes and hurricanes have become more frequent, and are both more extreme and less predictable; and yeah, we seem to be having more draughts, floods, and weather disasters worldwide, but who is to say that all such occurrences aren’t “normal” aberrations or “random” climactic events. Well, climate scientists, for one, who are almost of a single mind that global warming exists and is getting worse—and they even seem to be wholly in agreement as to its primary cause—but as a grand phenomenon it still remains something that is difficult to see. We can see the parts, but the whole seems to be ever so elusive to sight. And because we can’t see the whole there is a too easy tendency to treat it with a certain nonchalance—indeed, to act as if it isn’t there at all. The recent wildfires in San Diego are a case in point. 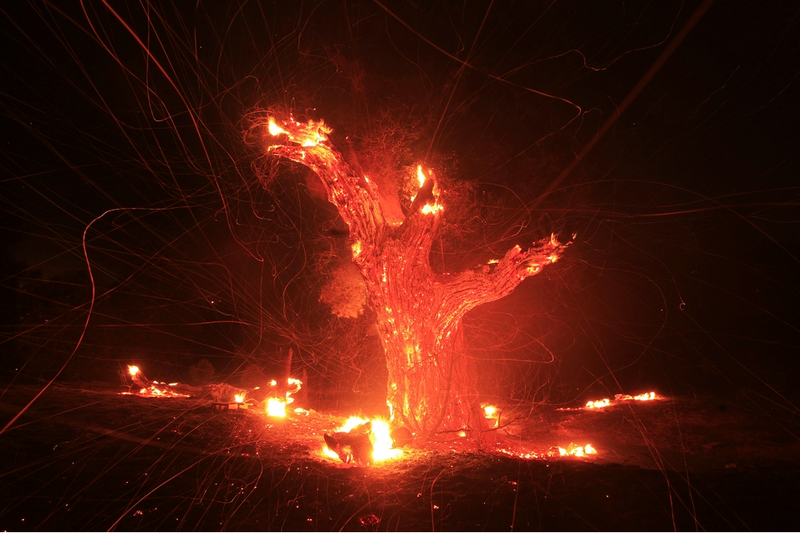 Wildfires in the southwest are not particularly new, a more or less regular effect of the dry Santa Ana winds that turn trees into combustible tinder. But the most recent wildfires, which consumed 25,000 acres, were wholly out of season. As one fire chief put it, “This is unbelievable. 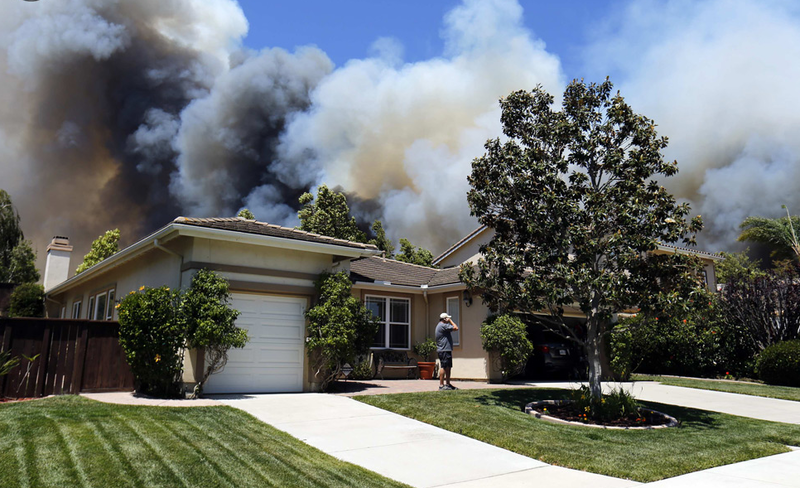 This is something we should see in October … I haven’t seen it this hot, this dry, this long in May.” Nor were such fires restricted to San Diego, as similarly unseasonal fires have occurred in both Arizona and Alaska! And yet there remains a popular tendency to think of these disasters as singular events, unconnected to one another, and so as damaging as they might be we fail to make the connections to common causes—or to the fact that perhaps we are looking at what might be the new normal. 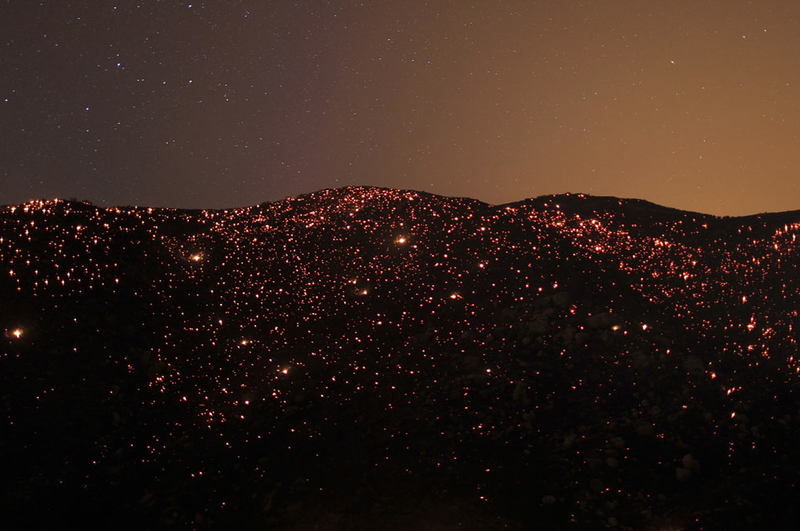 Photographs of such fires have been abundant, but each year they tend to be pretty much the same. 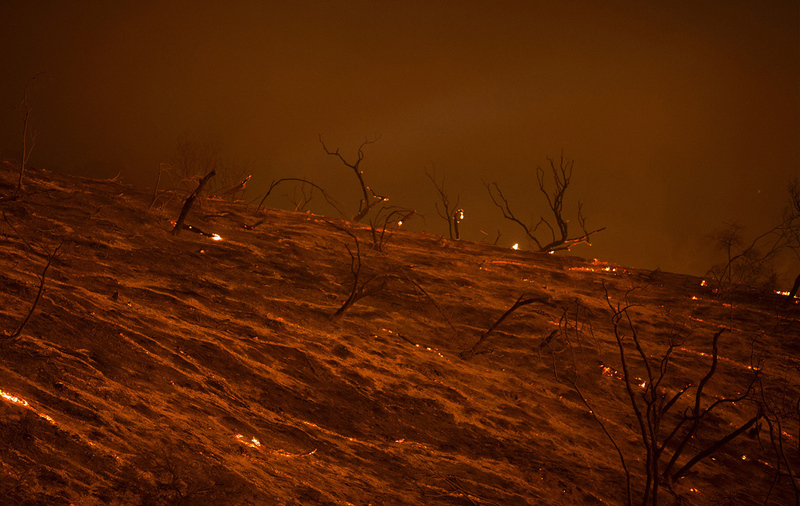 Pictures of forests ablaze, oftentimes shot in the evening, which give them an eerily romantic veneer, firefighters working to contain them, and aerial attempts to put them out by dropping water and other fire retardants on them. And, of course, there are pictures of the aftermath as well. The photograph above is somewhat distinct in this regard. It too seems to register a sense of the regular and the ordinary, but it does so with an ironic twist. It shows a scene from Carlsbad in the San Diego area. The fires have made their way ever so close to this development of houses, but as you can see, the owner (if that is who he is) doesn’t seem to be overly concerned. Casually dressed, he seems inured to the grey and white billows of smoke that seem to be emerging out of his back yard. Talking on his telephone one might imagine that he is calling the local fire department (or is it his insurance agent), but then again it could just be a conversation with a friend for all the nonchalance he seems to display. Indeed, he doesn’t appear to be showing any real concern for the inferno behind his house whatsoever; dispassionate, if not altogether indifferent, he leaves the viewer wondering if he even acknowledges that it is taking place at all. And truthfully, by the time you read this post the new cycle will have shifted one more time and we will be on to other local tragedies. And therein lies the rub. For one would think that something truly is at stake here. But perhaps when confronted with impending catastrophe that has been normalized and is so close that we don’t know what to do about it we are inclined simply to look the other way, to make believe that it is not there—even when some of the evidence is in our own backyard—or worse, to assume that somehow we can simply learn to live with the parts and not imagine (let alone worry about) what it all might add up to. As it is with such fires, so it is it would seem with larger problem of global warming. The parts are everywhere to be seen, to be sure, but to see the whole we have to work harder to connect the dots. Unlike the man in the picture, we have to look to our own backyard, even as we cast our gaze farther afield. Of course the fire makes the picture, but it’s the silhouettes that have the most to say. Which is interesting, as they are enigmatic. Silhouettes often are, which may be why they can stand for a dimension of photographic representation that we often overlook. Behind the realism, there is a formalism that is especially important for visual meaning; and behind the detailed textures of specific people and places, there is embodiment of the impersonal poses and attitudes that structure social behavior. This is not to choose one dimension of the image over another, but to respond as prompted by the photographer’s art. And by working into the image along that path, interpretation can lead to much more than documenting circumstances. Those circumstances may support reflection or become irrelevant for the time being (and only that), but they no longer are the primary content of the image. 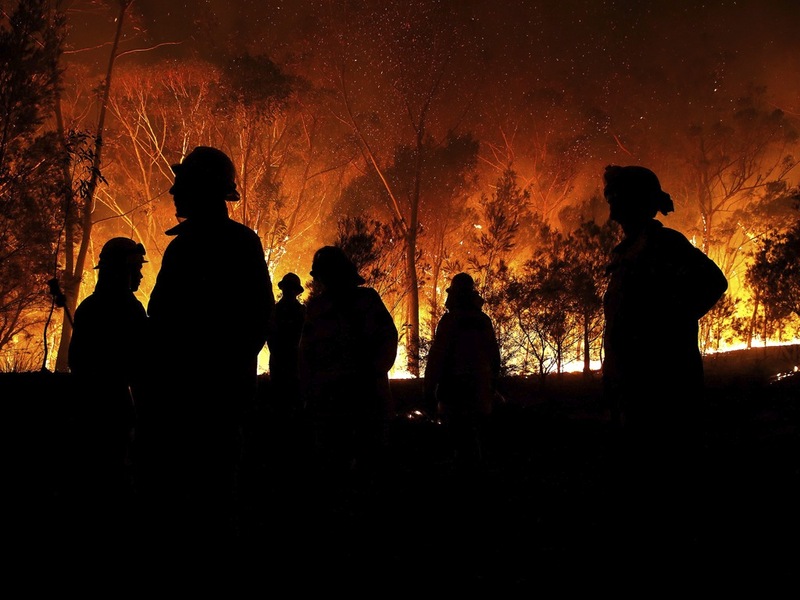 So it is noteworthy that this is a photograph of firefighters in a backburning operation in New South Wales, but they could be in LA or Arizona or Greece or many other places. And if the poses still have the traces of British clothing and deportment, that may be fact or conjecture, but there is no need to make too much of it, even for a joke. Jokes to come to mind, however, and so the trace might be a good clue that something interesting is lodged there. Stiff upper lip and all that, you know. Say, do ya think the coach is due, mate? Aussies will howl, but like I said, the details don’t really matter. So what does matter? That’s a double question here. First, what matters in the composition? The answer seems to be the stark contrast between the holocaust in the background and the calm, silent, reflective poses of the people in the foreground. Keeping their distance from one another, staring in different directions, hands in pockets, each seems to be lost in thought, while all of them seem to be standing as if waiting for a bus or train, strangers on street or platform, nothing out of the ordinary, just another day in the life. They stand as many stand while enduring the obligatory routines of traveling through impersonal public spaces, safe but not familiar with the strangers around them, biding time until they can get to where they are going, each on a private journey made possible by but still separate from what they have in common. Even when what they have in common is territory on fire on a planet that is getting hotter every year. Which gets us to the second sense of what matters, that is, what the photo is about. The answer to this question takes us both closer to those in the picture and farthest from the actual circumstances of the moment. More detailed knowledge of the scene probably would verify that they are a close-knit, well-trained work crew, that the fire (which they set) is under control, and that no one is at risk because of their skill, knowledge of the terrain, available escape routes, and similar precautions. My take on the image moves away from all of that, to get closer to what is being shown. What matters is that people can get used to anything, that Western culture will follow its commitment to controlling nature to the gates of hell, and that denial of global warming comes as easily as waiting at the bus stop because it comports so well with maintaining the routines which are among the few anchors we have in an era of rapid change. So, we can wait for the cosmic bus to come and take us away to some better place, or we can turn and look around, and look at each other. Even the beauty of the conflagration is there to help: if we could at least recognize that, it would be step forward. Fire is beautiful, but cinders–not so much. Take a look, while you still can. Photograph by Brad Hunter/Newspix/Rex Features. FYI, for other posts on silhouettes, go here; on wildfires, go here. One of the complaints against the photograph as a medium of representation is that offers a partial view of the world that distorts reality. The complaint is spot on, though to be fair we have to acknowledge it recognizes a burden that every mode of representation bears. A more useful approach is to recognize the capacity of photographs to offer multiple views of the world that frame and underscore the complexities of the universe. Consider the photograph below, an image that circulated widely on mainstream slideshows last week. Without a caption it is hard to know exactly what we are looking at, but it is also hard not to look at it. Shot from a distance and on high it appears to be a landscape of some sort, and the contrast between the horizon and the body of the image invites our attention. The lights below appear to twinkle, lending something of a human quality to the image, perhaps marking something like civilization, but it is the aura that marks the boundary between the horizon and the body of the image that gives the image its distinctive quality. Perhaps the sun is setting, or maybe it is about to rise, but in either case, the image invokes what we might call a sense of “tranquility” that is altogether aesthetically pleasing. It is a beautiful image, and whatever it is that is being represented, the perspective calls attention to that beauty. From a different perspective, however, the affect is somewhat different. Shot now from a much closer vantage, the field of vision straight on, the contrast between lightness and darkness is not gradual but stark, and as a result the image does not invite a sense of tranquility but rather a sense of violent disruption. It is still hard to avoid looking at the image, however, but what in the earlier image appeared to be a quiet and restful twinkle is here blazing hot. Indeed, one can almost feel the heat consuming what appears to be a tree, and in its own way it reaches out to whomever stands in front of it, at once pulling them in and warning them off. It is what Edmund Burke characterized in the 18th century as an instance of the sublime, a representation of a natural scene that manages the contrast between intense lightness and darkness so as to invoke simultaneously a sense of horror and pleasure. What is important to acknowledge is the fact that both photographs are of the same scene at roughly the same time. In each instance we are observing a wildfire burning out of control in Banning, California. Is the scene tranquil or violent? Is world represented here harmonious or out of control? Is it beautiful or is it sublime? The answer to all of these questions is, in some measure, yes! The event being represented is simultaneously tranquil and violent, harmonious and out of control, beautiful and sublime. And it is the capacity of the camera to show us how such apparently contradictory qualities can (and regularly do) co-exist simultaneously in a single event or phenomenon that makes it such a powerful and important technology of representation. In short, what might be understood as the weakness of photography as a medium of representation might well be its greatest strength. It is all a matter of how you look at it! Slow violence refers to environmental disasters that occur so gradually that we barely see them, but which reap long-term, catastrophic outcomes. Recent global warming trends top the list and what makes such phenomena all the more problematic is how they can often appear to be incredibly, breath takingly beautiful, approaching what we might even call the sublime—representations that in some measure transcend reality, transporting us to a place that defies the very capacity for representation itself. The photograph above is perhaps such an image where sky and water bifurcate the horizon of here and there as variations in lightness and darkness mark the temporal distance between now and then (or perhaps past and future). The orange and magenta tones of the sky cast a calming shadow upon the sea which masks the mysteries of who knows what within its otherwise murky depths. And overall the image invites both our approach and avoidance as if a heavenly and sanctified location. It is hard to not look it and to be in awe. Only the protuberances that emerge from the bottom of the frame call attention to the fact that this is a photograph and not a scene that fully transcends human occupation. 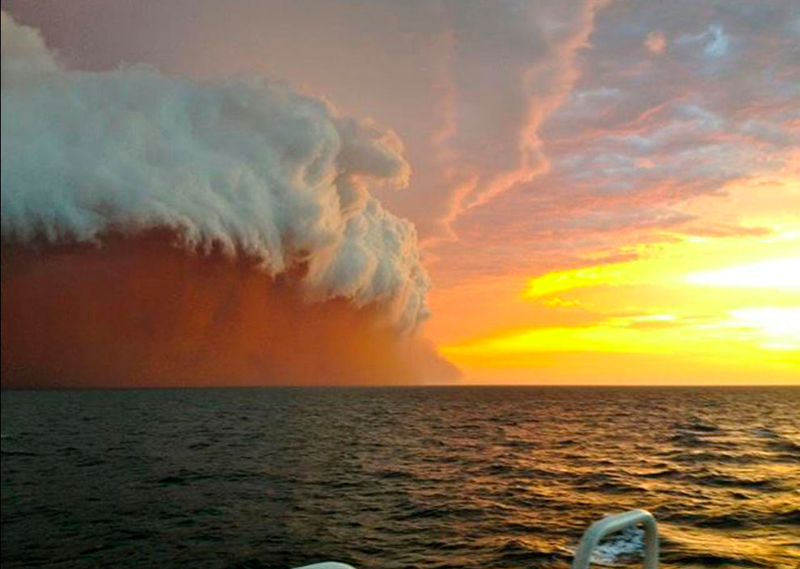 What we are actually looking at is “haboob,” a white shelf cloud of dirt that has been stirred up by a ferocious dust storm in the Indian Ocean off of the coast of Western Australia. This dust storm, one of many that has caused brush fires over nearly one million acres is the result of uncharacteristically hot temperatures peaking at more than 119 degrees Fahrenheit in some parts of Australia. 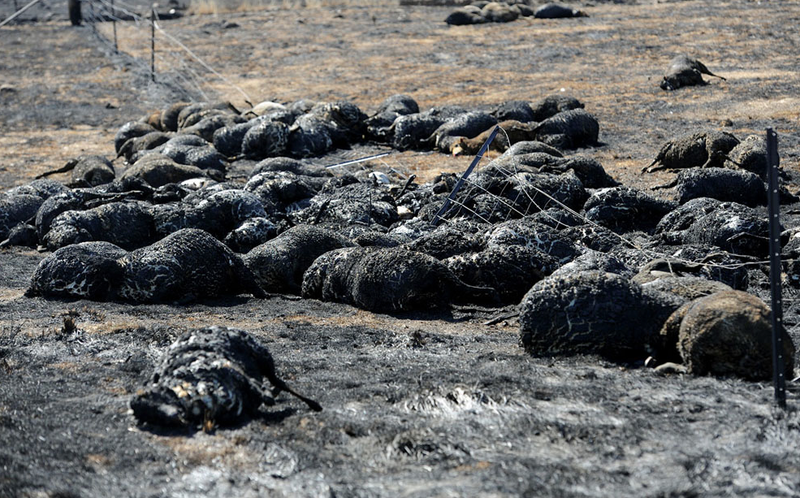 The result of those brush fires invites consideration of sublimity’s counterpart, the grotesque, as a second photograph from New South Wales pictures the carcasses of sheep incapable of breaking free of a fence that contained them while a wildfire consumed the earth on which they stood. The bodies are not human, and so the tragedy is not as pronounced as it might be—not that we should scant the lives of sheep or other living beings—but it is not hard to imagine that they could be human bodies. The image is hard to look at, but that would seem to be the point, as it works as a powerful, visual counterpoint to the awe-inspiring beauty that all too often and all too easily diverts our attention and placates (gratifyingly so) our acceptance of slow violence in the first place. This is the third winter in a row that we have faced extreme weather patterns throughout the world. These are the winters of our discontent. How much longer will they go on before we respond responsibly as global citizens is the real question we need to be asking. 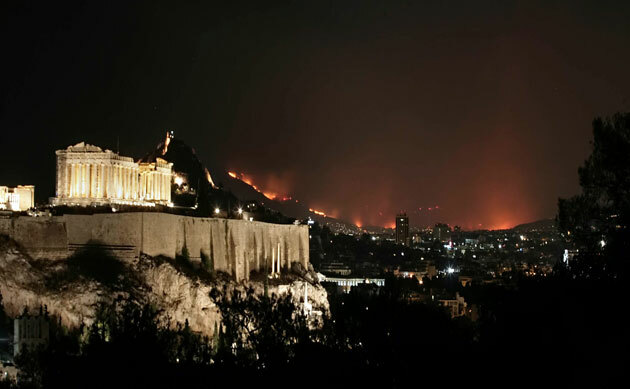 As fires engulf one side of Athens, Greece, the Parthenon arises above the city in magnificent splendor. Marble bathed in electric light, the monument anchors the image. One could almost image a cosmic battle between firestorm and enlightenment. Culture rises up against Nature, a glorious past against a chaotic future, continuity against conflagration. In between lies the city. Although hundreds of thousands of people will live and work there, it is subordinated between the monument in the foreground and the ring of fire on the horizon. Set in a natural crater, in the middle distance, with small lights scattered across it as if they could wink on and off, the city seems to lack both significance and power. Actually a dynamic achievement greater than any monument or natural event, here its fate seems poised between two alternatives, one of which is no longer possible while the other is terrifying. It becomes merely a firebreak between past and future, between a lost world and the task of staving off disaster. You may have to look at the image for awhile to notice the city at all. The monument dominates the scene, and there is reason to be suspicious of its prominence. Is Athens only the conservator of the Golden Age of Greece (and, according to the standard narrative, the West)? Are we to be reassured that the shrine still stands, despite whatever havoc is being experienced by ordinary people whose houses are in the fire zone? If the photograph reveals a deep tension between civilization and catastrophe, it also may be helping some return to a false sense of security. I won’t dote on this unusual shot of the Washington Monument, but it is a remarkable example of how the conventional view–and experience–of a public work can be altered by a change in angle and lighting. Instead of the white tower rising in sublime simplicity amidst the capitol city, we see what could be ancient ruin. 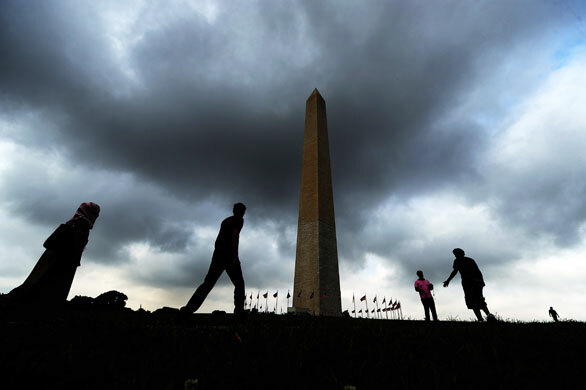 Stragglers wander about the obelisk on a dark plain under a threatening sky. We could be on a moor near Stonehenge as pilgrims pass by on the way to another destination. The pennants in the background could be from a temporary fair in some dark age yet to come. Again, the future seems much less promising than the past. The difference here is that, instead of using the monument to anchor collective experience against disruption, now the public icon has been turned against that conventional experience. Instead of security, the monument anchors a sense of foreboding about the national project. Two monuments, two visions. The photographs in each case contain no news, but they do provide allegories of collective life. Photographs by Milos Bicanski/Getty Images and Jewel Samad/AFP-Getty. For other NCN posts on wildfire images, go here, here, and here.